This morning the appeals court ruled that the word be “exclusively" used by Muslims . The director of "Malaysia Herald", Fr. Lawrence, expresses " disappointment and shock " and announces appeal to the Federal Court to seek redress. Minister of the State of Sarawak (Borneo ) states : Here Christians can continue to use the word Allah. 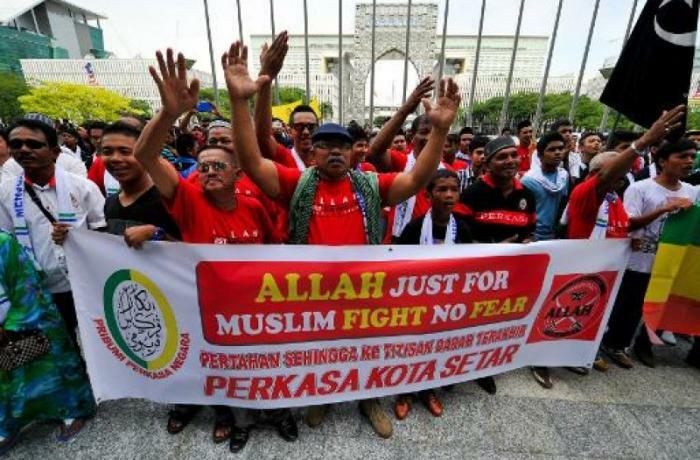 Kuala Lumpur (AsiaNews / Agencies) - A Malaysian court has ruled that non-Muslims can not use the word "Allah" to refer to God , overturning an earlier ruling of 31 December 2009 in favour of Christians' right to do so. A decision that, at the time, had created controversy and sparked extremist attacks on churches and mosques. This morning the judges of the Court of Appeal determined that the opening to non-Islamic faithful would have "created confusion within the community ." In response , Christians recall that they have used the name " Allah " to define (also) the Christian God for decades and that the new provisions - strongly desired by the government, to meet the demands of the more fundamentalist segments of the country - violate their rights and religious freedom . Outside the court a hundred Muslim activists waved placards and chanted slogans in which they maintained that the word "Allah" be "exclusively " used by Muslims . In the courtroom, the chief judge Apandi Mohamed Ali ruled in favour of the executive and rejected requests ( corroborated by previous judgments ) of the group led by leaders of the Catholic newspaper the Malaysia Herald. " The usage of the word Allah is not an integral part of the faith in Christianity" the judge ruled, "the usage of the word will cause confusion in the community." Fr. Lawrence Andrew, editor of the Catholic newspaper , said he was "disappointed and dismayed'" by the decision of the judges and that they will resort to the Federal Court to seek redress. The battle in court is thus not over, but it will now be up to the highest forum of the national judicial system . "It is a retrograde step in the development of law in relation to the fundamental liberty of religious minorities." In Indonesia and the Middle East , he adds, Allah is used by Christians and Muslims alike. He therefore calls on Christians to "continue to pray for justice " and added that the Church will not bow to an unjust sentence , but it will move ahead with the appeal . Meanwhile, the Minister of Agricultural Development of the Malaysian state of Sarawak - one of the territories that make up the Malaysian part of Borneo Island - announced that Christians in the area can continue to use "Allah " to define their God. He described today's decision by judges "not authentic" and complains that only Muslims can use it. " We (Christians in Sabah and Sarawak) have been using the word Allah for over 100 years. Why suddenly we are now told we cannot use it?." He concludes that Muslims in Sabah and Sarawak , whom he describes as "brothers" , have never opposed the use of Allah by Christians . The controversy over the use of the name "Allah" for the Christian God in the media and books, like the Bible, in Bahasa Malaysia broke out in 2008, when the Home Ministry threatened to revoke The Herald's license to publish. In response, Catholic Church leaders sued the government for violating rights enshrined in the Constitution. They added that the Christians of Sabah and Sarawak have used the word "Allah" for generations without problems , as it has done for 14 years, the Catholic weekly . In 2009, the High Court granted Catholics the right to use the term "Allah", a ruling that shocked and angered Muslims, who consider the word exclusive to Islam. This was followed by a wave of violence with attacks and improvised explosive devices used against churches and other places of worship. In an attempt to stem the tide and appease extremist Islamists, the Malaysian government decided to appeal the High Court ruling. Malaysia, a Southeast Asian nation of some 28 million with a Muslim majority, Christians are the third largest religious group (after Buddhists) with about 2.6 million members. When a 400-year-old Latin-Malay dictionary was recently republished, it showed that the word "Allah" was used from the start to name the biblical God in the local language.